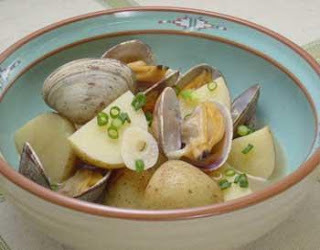 Spring season is a very good time for eating clams in Japan. Last weekend, my wife made a good recipe. I recommend having sake with this dish. Cut the potatoes into 1/4 (big potatoes 1/6) pieces. Peel and slice the garlic clove. Fry clams and garlic in pan with sake and cover. After clams open, remove them from pan. Put water and potatoes in pan and boil until potatoes are soft. Finally, combine soy sauce, clams, salt and scallions in pan. This recipe looks delicious and also thank you for your blog it is very interesting.